Three hour tours are usually placid and boring, except when Gilligan accidentally sabotages the Captain's life raft by using water-soluble glue made from pancake syrup, or mistakenly sends jungle boy Kurt Russell home alone in the Professor's hot air balloon, or loses the secret map showing how to get off the island...man, why didn't they just kill Gilligan? For three hour tours aimed at killing Gilligan! 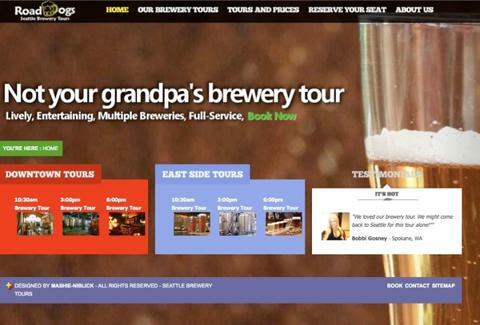 your thirst, Road Dogs Brewery Tours. Started by a crew of UW alums as a series of road trips in search of sweet microbrews, the just-open-to-the-public RD's now offering multiple daily guided tours of some of the region's sweetest suds producers, all of which last approximately three hours, start as early as 1030a (when the brewmaster is hard at work), and depart from Pike Place Market, Safeco Field or, if you're touring Eastside spots, a prearranged "pick up location in downtown Bellevue"...so see you at Rock Bottom!! The tours pull from fourteen possible stops, including the Market's Pike, featuring a full restaurant and strongly flavored suds like the Scotch-style Kilt Lifter; Baron Brewing, which slings German-style/Pirate-themed offerings at their Pillager's Pub in Greenwood; and Ballard mainstay Maritime, which's offering up taproom-exclusive brews and eats like their slider-style ground beef/house-sauced Lil' Jollys, also Santa's despicable slang term for elf boning. Eastside offerings range from uber-popular African Amber producer Mac & Jacks, to the formerly Ballard-based Redhook (the NW's largest brewery), to Redmond's 2010 Gold Medal Award-winning Black Raven, a description That's So...um, accurate? RD laces everyone with free pint glasses and tees, and, in addition to their standard tours, offers hourly private numbers that allow you to choose the departure time, itinerary, number of beer spots you hit, and whether or not you plan to bring Ginger(s).